Do you like stupidly high wattage output from your advanced personal vaporizer? How about from your inexpensive vaporizers? If you answered yes, the sub-$50 Wismec Predator 228 may be worth looking into. Vapor4Life was kind enough to send me one of these devices for review, so that’s what I plan to do. Is the Predator the king of the jungle, or is it prey. Ok the wordplay is getting out of hand here. 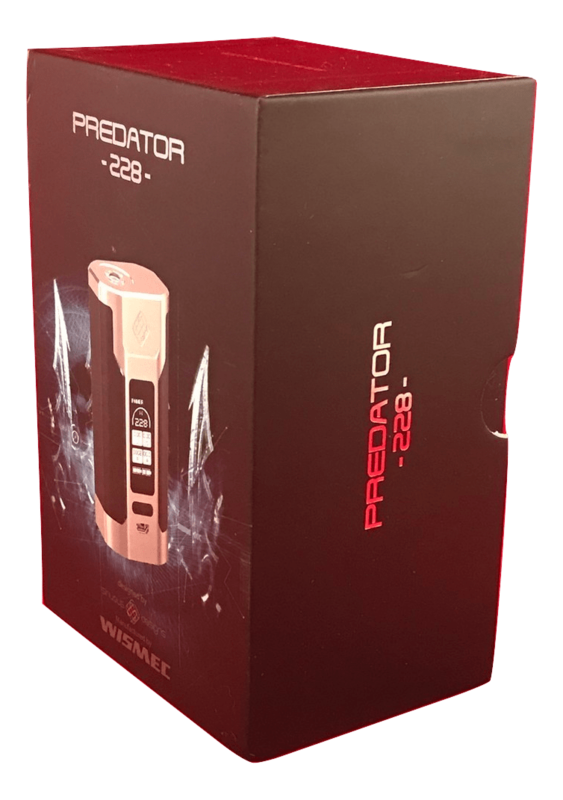 So do me a favor and read the rest of the Wismec Predator 228 review and I promise I’ll knock it off. Disclosure: I received this product free of charge for review purposes. This review contains affiliate links. They also sent me some of their very tasty Burst e-liquid. First impressions: this is a good-looking mod. It has some interesting lines. The corners are thankfully rounded, but they aren’t just rounded. There’s a reasonable radius to corners that accounts for about a quarter of the device’s facing. In addition there’s some nice styling on the front and back of the vaporizer. There’s sort of an hourglass motif going on there. But, that design isn’t just there, it’s more or less a way to blend in the Predator’s coolest feature. There’s no fire button. Instead, the entire left side of the device is the activation mechanism. You squeeze the Predator 228 to start enjoying your vape. I sometimes struggle with button placement on vaporizers, but with this one, there’s no need it doesn’t matter where you press, just a gentle squeeze does the job. There’s a nice bit of tactile feeling and a gentle when you press the button as well. There’s no guessing whether or not you’ve squeezed hard enough. Nestled between the trigger on the side and the matching detail on the opposite side is a decent sized OLED screen. The screen is big enough to show additional information in an easily readable view. 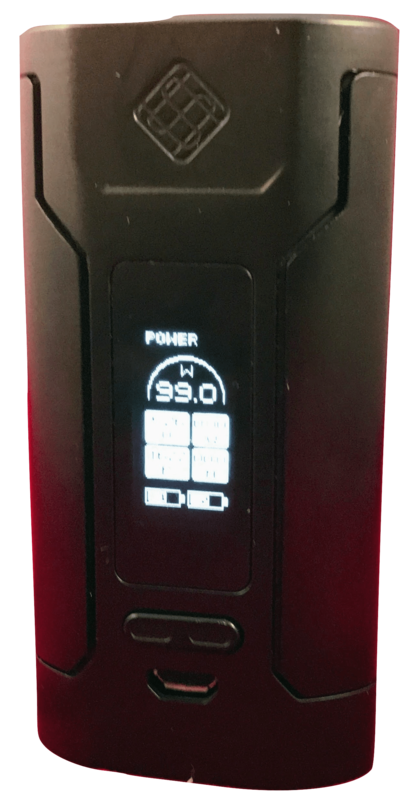 In addition to the wattage or temperature setting displayed at the top, there are four boxes displaying the current active voltage, the atomizer resistance, the number of puffs and the amperage output. The last two boxes are kind of pointless. Does anyone really keep track of the number of activations? If so, what do they do with that information? Amperage can be useful, but it only displays while the device is activated. I guess it’s good at a glance, but probably of limited value. Individual battery level icons are at the bottom of the display screen. Those are useful. Having two battery graphs is very useful for discovering that one battery is discharging at a different rate from the other. Beneath the display is a USB port. It can be used for charging the device, but it’s generally better to use a dedicated external charger. The batteries can be removed and replaced via the battery door on the bottom. It’s one of those gravity operated battery doors that has a spring-loaded button that slides to release the doors. I kind of hate those. Why do I hate? Because if you close the door without batteries in place, they’re next to impossible to open without the weight of the batteries pushing against the door. You end up holding the vaporizer at weird angles to get the door to drop. It makes you look kind of dorky in the process. I’m just going to put this out there now. I have no intention at vaping at the high-end of this device’s output limit. If you want a review that pushes this device to the max, you’ll need to keep Googling. That being said, I have unintentionally used this device at the full wattage range. The Wismec will occasionally ramp up the wattage while it’s in my pocket. I don’t pay attention, and bam! Really funky vape. In all fairness, that’s totally my fault. If you’re not an idiot like me, you turn off your vaporizer before sticking it in a pocket. It’s not hard, five quick squeezes turns the Predator off or on. In general, I can’t find fault with the performance of the Wismec Predator. It has no problem running stuff at my preferred range between 70 and 100 watts, depending on what I’m using. The ergonomic design makes it a pleasure to vape with, unlike some devices that shall remain nameless. 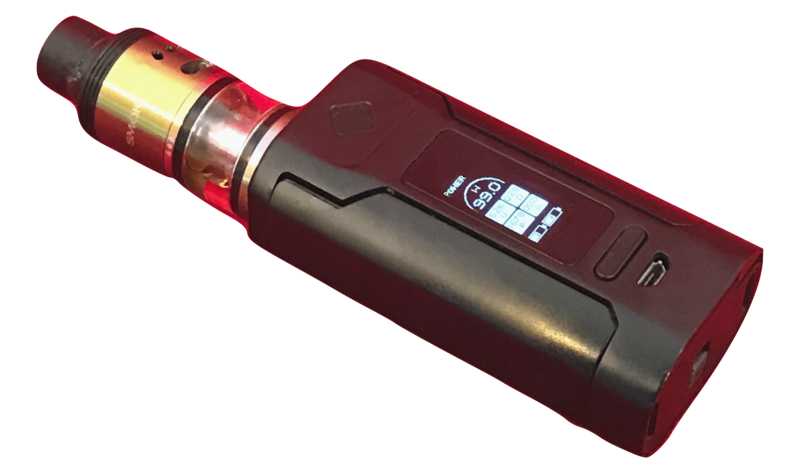 The Predator 228 with its dual battery is not as tiny as the little iStick Pico, but it’s compact enough not to be difficult to put in a pocket. About the only real complaint I have with this device (beyond the stupid, stupid battery door) is that the overvoltage protection is a little sensitive. I’ve had it go off on some of my rebuildables where other devices won’t. Typically disconnecting the tank and reconnecting it will set things right again. Come to think of it, it may be the Predator’s way of protecting me from myself. When I tried to change to temperature mode with a coil that wasn’t made for it, the 228 switched itself back to power (wattage) mode automatically. What a friendly Predator, looking out for me like that. The Predator is under $50 and offers high performance, good looks and a solid design. It’s also one of the most ergonomic vaporizers I’ve used. This one should be at the top of your list. For extra savings goodness, there’s a coupon code good for 10% off sitewide and free shipping at Vapor4Life good through September 27, 2017. I’ve already added it to the button for you.